Episcopalians believe that Holy Baptism is the sacrament by which God adopts us as God’s children and makes us members of Christ's Body, the Church, and inheritors of the kingdom of God. We baptize both adults and children. Since baptism involves a promise to be formed in the Christian life and to become a member of the church, we ask that all persons desiring Baptism attend the church for at least six months before their Baptism. During that time, adults will take classes for at least 6 months and parents of children to be baptized and their godparents must attend at least two preparation classes. Baptisms are celebrated on the Feast of the Baptism of our Lord (2nd or 3rd Sunday in January), at the Easter Vigil (the Saturday night before Easter), on Pentecost (50 days after Easter), and All Saints Sunday, the first Sunday in November. All who are baptized can receive the Sacrament of the Body and Blood of Christ. If parents would prefer that their children receive Holy Commuion when they are 7 or 8 years old, the child and parents would participate in classes to prepare for their Holy Communion. 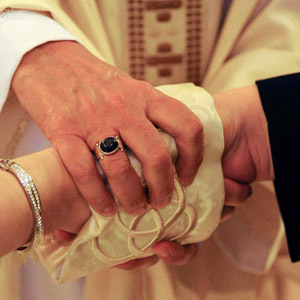 Episcopalians believe that Holy Matrimony is Christian marriage, in which the two adults enter into a life-long union, make their vows before God and the Church, and receive the grace and blessing of God to help them fulfill their vows. We marry both opposite gender and same gender couples. If a person desires to be married in the church, they must attend church for at least 6 months prior to their marriage. At least one person must be a baptized Christian. If either person was previously married, they must present to the priest the reason for their divorce and the priest would determine if the person can make the lifelong committment to enter into a second marriage. The Bishop would have to agree with the priest’s decision. The couple would have to attend at least 4 meetings with the priest.